Jonelle Baxter lives in the rural Western Australian town of Bundara. There she’s the local mechanic and she also helps out on her family farm whenever they need it. Jonelle has grown up on the land and it’s her home. She can never see herself leaving, even though a crippling drought has taken its toll on the Bundara residents. Some have lost their farms and many more are unable to plant the crops needed to harvest or feed their stock. That means they aren’t always able to make their repayments to the bank. It’s a fine balance in Bundara, keeping the bank at bay and trying to get the most out of a landscape that has become hopelessly barren. Even Jonelle owes a lot of money, mostly due to people not being able to pay her, or paying her in ways other than cash, such as a side of meat or groceries. Daniel Tyler is a new in town, an interim bank manager until a new, permanent one can be appointed. It’s his job to rein in the debts in Bundara and try and get some of these farmers back on track. The only other alternative is to take their farms, if they can’t pay. Most of them are in debt to the amount that it’s just impossible to climb out of and Dan knows his job isn’t going to be an easy one. But he never gets involved with clients, he never socialises with them, it’s just business. He’ll only be there two months and then he’ll be back to the city eyeing a big promotion, working his way up the banking ladder, just like his father. And that’s all very well and good…. until Daniel meets Jonelle. The Sunburnt Country is the latest novel from Fiona Palmer and after reading her last novel, The Road Home last year, it’s one I was looking forward to. We meet Jonelle, Torana lover, car racer, mechanic and deeply devoted to her family, friends and also the small town in which she lives. According to her friend Nae, Jonelle needs a man but Jonelle doesn’t really agree. She’s happiest hanging out in her workshop, fixing up cars, or watching a movie with her childhood friend Ryan Cooper, aka Coop. When she meets Daniel Tyler, struggling by the side of the road with a flat tyre, she feels more than a flicker of attraction as she helps him change the tyre. But given the way he’s dressed, she knows he’s from the city and is sure she’ll never see him again. She almost wishes that were the case when Daniel turns up as the new bank manager – someone Jonelle was always going to be programmed to dislike. City people have no idea what life is like in the country – it’s not all about money. To Dan, it’s quite simple – it is all about money and this is his job. Either people pay their loans or the bank moves to take back their land. This is not something that has ever bothered him before, it’s a fact of life. But here, in this tiny town, he gets to know the population. These aren’t anonymous voices at the other end of a phone line, these are people he sees at the local pub for a beer after work. He finds himself questioning things that he’s never really questioned before as he spends time in this town, particularly time with Jonelle. Despite a rocky start, they come to be friends, the mutual attraction never really abating. But Jonelle is a realist and she isn’t looking to start something with someone who isn’t going to be sticking around. They’re from different worlds. Jonelle can’t see herself living in the city and Dan has a promotion to go home to. This book had me sucked in from the get go. I loved Jonelle – what’s not to like about a girl who wears overalls, races stock cars and is a mechanic? She was honest, down to earth and I loved the relationship that she had with her friends Nae and Coop and her family. I also loved the way she felt about the town, the way that all of the residents felt about the town actually. They rallied in so many ways – as volunteer ambulance officers, fire and rescue, supporters and fundraisers for men’s issues, etc. And yet because I’m also a city girl, I could understand where Dan was coming from as well, in trying to do his job. It’s a harsh reality that sometimes, when people haven’t been making payments, that banks are going to take action. It’s not always possible to keep extending the loans and just praying that the next season will be a good one. I felt that Jonelle was sometimes a bit unfair towards Daniel – he was only the messenger boy, not the rule maker. He was an employee of a bigger company and I think he did try to be compassionate after beginning to see just how different life was in Bundara to how he was used to in the city. There were several incidents in this book that really shook him up and helped open his eyes to the realities of life on the land. There was a strong theme of “things aren’t always what they seem” running through this book, right from Daniel’s first perceptions of Jonelle, to his relationship with his father and what happened when his parents’ marriage broke down, to the way in which life is lived in the country. Palmer isn’t afraid to tackle a tough issue in this novel, one that I’ve been reading a little more of recently in rural fiction, the issue of depression, particularly among the males that live on the land. A stoic, keep-to-themselves sort of breed more and more farmers are being affected by depression and are at risk of suicide as mother nature wipes out their crops year after year and makes it almost impossible for them to claw their way back financially. I felt that this was quite well done, given the inclusion of Dan, the new bank manager, often the catalyst for such depressive episodes. In this novel, Dan does his utmost best to help people using his financial skills and the cold reality of a farmer attempting to take his life helps Dan to see just what life is like out here where your livelihood is at the whim and mercy of the weather, which can’t be controlled by anyone. The Sunburnt Country is an enjoyable story filled with likable characters and a deep appreciation for the land, even when it’s at its barren worst. It’s what I’ve come to expect from Fiona Palmer novels and I look forward to working my way through the rest of her backlist and getting excited about her new titles each year. 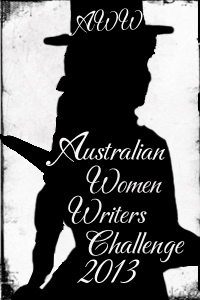 The Sunburnt Country is book #21 for the Australian Women Writers Challenge 2013. Hi Bree, I just came across this and have added it to my list of things to read. I’m writing an essay on depression in rural men and it looks like it has useful things to say! Hi Jess, another book that might offer up something for you is Purple Roads, by Fleur McDonald if you haven’t come across it already. It details a marriage that begins to struggle after a family lose their farm and the resulting depression in the male character from his feelings of failure. It’s pretty well done. Thanks Bree! I’ll definitely look that one up. I read Red Dust and still think about the characters from time to time, so it’s time I read some more of her work.